"Five Stages of Violent Crime"
"...There is a big difference between self-defense and personal safety...."
if -- and determine when and if -- you are being set up for a crime or violence. The information contained on this page is from DVD/video, Street Safe: How to Recognize and Avoid Violent Crime. It is used by police, military and firearms instructors around the world as a training and teaching tool. Also the system is taught internationally in self defense and crime prevention courses(1). While we strongly advocate awareness and avoidance as a primary means for personal safety sometimes that isn't enough. The Five Stages of Violent Crime has been tested in court as an easily explainable standard by which individuals determined if they were legally justified to use self defense tactics. Remember, when it comes to violence there are usually legal repercussions. Therefore we strongly advocate you know when you are justified to use force. During the first three stages, you can prevent an attack without the use of violence. These are where the criminal (or violent person) decides whether or not he can get away with it. He may want to (Intent), but if he doesn't have the opportunity (Positioning) he cannot succeed. The Interview is his way to double check if you are safe for him to attack. If these conditions are not met, he will not attack! What we are about to say is not hyperbole. Selecting a safe victim is a matter of life or death for the criminal. If he picks the wrong target, he's the one who is going to die. Therefore, he's going to make sure he can successfully use violence against you (Interview and Positioning) before he commits himself to act. Once he is sure of his ability to succeed -- and has put you in a position where he can quickly overwhelm you -- he will attack. This is where the person crosses a normal mental boundary. From this point, the person is mentally and physically prepared to commit violence in order to get what he wants - whatever that may be. Being able to recognize when intent is present is one of the key components of your personal safety. yet, this isn't always easy as you might think. The criminal has often learned how to mask it behind words and feigned innocence. But once you know how to spot the physiological signs, it is easily recognizable. Learn more about intent. This is the criminal putting himself in a place where he can successfully attack you. A criminal (or even a violent person) doesn't want to fight you; he wants to overwhelm you. To do this, he has to put himself in a position where he can do it quickly and effectively. An attempt to develop positioning is the final proof of ill intent. Someone trying to position himself to attack removes all doubt that the situation is innocent. Like the Interview, there are several kinds of Positioning. The attack is the when the criminal/violent person commits himself to using force -- or the threat of force -- to get what he wants. Like the other stages there are important distinctions to be made about the kind of attack you will face. Two major problems exist regarding self-defense. The first is knowing when to use it. How do we know when is the right time? How can we be sure we are not overreacting or starting at shadows? We should all have reservations about using force. Much of this confusion is alleviated by having a proven and external set of standards to compare a situation against. If you don't see the triangle, it is not the time to use violence. The other problem with self-defense is the legal ramifications. In many states, you risk being prosecuted for "attempted self-defense," both on a criminal and civil front. What was an obvious threat at the time can be later undermined in court by an attorney. When the DA asks how you knew you were in immediate danger you had better have a better answer than "he looked at me mean." If you end up in court to defend your defending yourself, either system will help you clarify and rationally explain why you thought your actions were warranted. The DVD Street Safe shows you what has been discussed on this page. 1)LEGAL WARNING: This is a condensed version of information found in my book, Safe in the City and the video/DVD Street Safe/Safe in the Streets. While it is offered to the general public for personal use, it (like everything else on this Web site) is copyrighted and registered material. Commercial dissemination of this system without express permission from, or credit to, the author constitutes infringement. Both State Roads 129 & 247 are being resurfaced at the same time. This construction will result in lane closures, [down to 1 lane roads] from now through Dec. 08'. Keep this in mind and allow extra time when traveling to class. ADHD It's not just for adults. Are You an ADHD Adult? Got the lunches made. Oops, forgot to let the dog out. Need to pick up the dry cleaning. Michael’s hair is a mess. Do I have to take the car in today? I’ll need to reschedule my manicure. Anyone seen my keys? Is the carpool here already? If this scatter of thoughts seems familiar, you may be one of the estimated six to 15 million adults with ADHD…Your inattention and restlessness may not only be the quirks of your personality. You may have ADHD (attention-deficit / hyperactivity disorder), a behavioral disorder that most of us associate with unruly children. But, in fact, about 65% of children with ADHD carry the disorder into adulthood, making it an adult problem as well.Although ADHD adults may develop better coping skills than they had as children, they still struggle to get through the day. Not only does ADHD interfere with organizing and completing daily tasks, but adults with the disorder are also prone to depression, anxiety, forgetfulness, and even an increased risk of divorce and car accidents. Even simple duties may demand great concentration and effort. In part, that’s because ADHD adults are easily distracted by sound, sight, or even touch. Whatever the stimulus, ADHD adults may be knocked off-course by even minor distractions. The three core symptoms of ADHD are inattention, hyperactivity and impulsive behavior. The symptoms of inattention include losing track of thoughts or focus in the middle of tasks; missing details or making careless mistakes; inability to complete work assignments; forgetfulness; and difficulty following instructions.The symptoms of hyperactivity in adults are similar to those in children but more subtle: constantly shifting in a chair, tapping your feet or a pencil, playing or tugging at hair or clothing. Even those aware of their repetitive motions may be unable to stop.Impulsive behavior can be even more annoying in adults than in kids – and potentially dangerous. ADHD adults tend to bug the rest of us: We wish they would “grow up.” They tend to interrupt constantly or blurt out inappropriate comments. They can’t stand waiting in lines and may try to cut in front or find a “friend” near the head of the line. They also have trouble anticipating the consequences of their actions. Although this lack of foresight in children can be disruptive, in adults it can threaten families, jobs and even safety. A young ADHD adult paired with a car can be a dangerous combination. In the workplace, ADHD can erode performance. Some people with ADHD change jobs often or have trouble holding a job. The way they handle tasks shifts from one to the next: One assignment is done well, but the next is late, poorly done or incomplete. The ADHD adult feels like he breezes through some tasks but he can’t get any traction on or stay interested in others. Co-workers are puzzled by this variability, often attributing it to personal problems or even substance abuse.Unfortunately, scientists don’t yet know the cause of ADHD and laboratory tests can’t confirm a diagnosis. They do know, however, that the disorder runs in families. If you have a parent with the disorder, you have more than a 50% chance of having it as well. If you have a child with ADHD, you have a 25% chance of already having the disorder yourself. Unlike childhood ADHD, which affects three times as many boys as girls, adult ADHD is more democratic, evenly distributing itself between genders.Doctors diagnose ADHD based on family, developmental and childhood history, current signs and symptoms. Still, ruling out potentially serious and/or treatable neurological disorders that can mimic ADHD symptoms, such as Tourette’s Syndrome, temporal lobe seizures, early stage brain tumor, elevated blood lead levels, hypo- or hyperthyroidism, and hearing or vision impairment, is important.Most workups for detecting ADHD include a physical exam. Some doctors will also request an EEG (electroencephalogram, which records the electrical activity of the brain), CT (computed tomography, or x-ray procedure, that records cross-sectional pictures of parts of the body, in this case the brain) or MRI (magnetic resonance imaging, a diagnostic technique that produces cross-sectional images of any body part, in this instance the brain) to rule out other conditions. ADHD has no cure. Fortunately, several drug treatments – primarily stimulants – are effective for both children and adults. Approximately two-thirds of ADHD adults taking stimulants experience significant improvements. And the drugs take effect fast, a remarkable finding. Few medications have such a profound and immediate effect. Unfortunately, most stimulants wear off quickly each day, returning adults to their usual difficulty of completing tasks and staying focused. Many ADHD adults turn to coffee. In fact, some can’t do without it; caffeine’s stimulating effect helps them focus and stay on task. In fact, some get so much relief from coffee that they become caffeine abusers, drinking excessive amounts of coffee each day.Stimulant medications, also called psychostimulants, include Ritalin® and Ritalin LA®, Methylin®, Metadate®, Concerta®, and Adderall® and Adderall XR®. Several of these brands offer long-acting formulations to reduce the need for frequent dosing. Only Adderall XR® is indicated for the treatment of ADHD in children, adolescents and adults.Non-stimulant medications are also available, including Wellbutrin® and Straterra®. Available since 2003, Straterra® is the first non-stimulant medication approved to control ADHD symptoms in children, adolescents and adults. Wellbutrin® is sometimes used “off-label” for treatment of combined conditions such as ADHD and depression. Off-label means that doctors prescribe the drug for disorders not officially approved by the Federal Drug Administration (FDA).Adults can also complement any drug therapy by using a few coping strategies. These include taking medications as directed (don’t double up if you miss a dose); making lists of tasks and keeping them nearby; taking a deep breath or excusing yourself from situations when you feel tempted to act out or interrupt; recognizing and minimizing stimuli that distract you (sounds, sights and physical sensations); and engaging in activities that you find calming or comforting such as gardening, walking or cooking. Does your mind wander while you are working on a task? Do you tend to start a project and have difficulty completing it? Does your attention stray in the middle of a conversation? Are you forgetful about appointments and regular events? Are you impatient when you need to wait? Do you fidget and shift constantly in your seat? Do you commonly lose track of keys, purses and other items? Do you interrupt others before they finish speaking? Is it difficult for you to manage or resolve conflicts? If these issues sound familiar, you may want to consult a healthcare professional. Resources:National Resource Center on ADHD Children and Adults with Attention-Deficit / Hyperactivity Disorder (www.help4adhd.org)Attention Deficit Information Network, Inc.
1Swartz M, Blazer D, George L, Winfield I. Estimating the prevalence of borderline personality disorder in the community. Journal of Personality Disorders, 1990; 4(3): 257-72. 2Soloff PH, Lis JA, Kelly T, Cornelius J, Ulrich R. Self-mutilation and suicidal behavior in borderline personality disorder. Journal of Personality Disorders, 1994; 8(4): 257-67. 4Zanarini MC, Frankenburg FR. Treatment histories of borderline inpatients. Comprehensive Psychiatry, in press. 5Zanarini MC, Frankenburg FR, DeLuca CJ, Hennen J, Khera GS, Gunderson JG. The pain of being borderline: dysphoric states specific to borderline personality disorder. Harvard Review of Psychiatry, 1998; 6(4): 201-7. 7Siever LJ, Koenigsberg HW. The frustrating no-mans-land of borderline personality disorder. Cerebrum, The Dana Forum on Brain Science, 2000; 2(4). 8Zanarini MC, Frankenburg. Pathways to the development of borderline personality disorder. Journal of Personality Disorders, 1997; 11(1): 93-104. 10Davidson RJ, Jackson DC, Kalin NH. Emotion, plasticity, context and regulation: perspectives from affective neuroscience. Psychological Bulletin, 2000; 126(6): 873-89. 11Davidson RJ, Putnam KM, Larson CL. Dysfunction in the neural circuitry of emotion regulation - a possible prelude to violence. Science, 2000; 289(5479): 591-4. What Really Goes On When We Sleep & Why Sleep Is So Important. ScienceDaily (Jan. 21, 2008) — Most people know it from experience: After so many hours of being awake, your brain feels unable to absorb any more--and several hours of sleep will refresh it. The UW-Madison scientists showed by several measures that synapses -- nerve cell connections central to brain plasticity -- were very strong when rodents had been awake and weak when they had been asleep. Given that each of the millions of neurons in the human brain contains thousands of synapses, this energy expenditure "is huge and can't be sustained. ""We need an off-line period, when we are not exposed to the environment, to take synapses down," Cirelli say. "We believe that's why humans and all living organisms sleep. Without sleep, the brain reaches a saturation point that taxes its energy budget, its store of supplies and its ability to learn further." The Wisconsin group was surprised to find that rats had an almost 50 percent receptor increase after a period of wakefulness compared to rats that had been asleep.In a second molecular experiment, the scientists examined how many of the receptors underwent phosphorylation, another indicator of synaptic potentiation. They found phosphorylation levels were much higher during waking than sleeping. The results were the same when they measured other enzymes that are typically active during synaptic potentiation. To strengthen their case, Cirelli and colleagues also performed studies in live rats to evaluate electrical signals reflecting synaptic changes at different times. This involved stimulating one side of each rat's brain with an electrode following waking and sleeping and then measuring the "evoked response," which is similar to an EEG, on another side.The studies again showed that, for the same levels of stimulation, responses were stronger following a long period of waking and weaker after sleep, suggesting that synapses must have grown stronger. The theory she and collaborator Dr. Giulio Tononi, professor of psychiatry, have developed, called the synaptic homeostasis hypothesis, runs against the grain of what many scientists currently think about how sleep affects learning. The most popular notion these days, says Cirelli, is that during sleep synapses are hard at work replaying the information acquired during the previous waking hours, consolidating that information by becoming even stronger. "That's different from what we think," she says. "We believe that learning occurs only when we are awake, and sleep's main function is to keep our brains and all its synapses lean and efficient." This research was published in the Jan. 20, 2008, online version of Nature Neuroscience. Adapted from materials provided by University of Wisconsin-Madison, via EurekAlert!, a service of AAAS. Trained to Kill: Are We Conditioning Our Children to Commit Murder? Children don't naturally kill; they learn it from violence in the home and most pervasively, from violence as entertainment in television, movies, and interactive video games. April 24: When he encountered an intruder in his home, Allan Kieta subdued him and held him until the police came — despite being blind. He and his family relate the amazing story in a TODAY exclusive. From natural disasters around the world to political maneuverings in the U.S.
From dogs united in matrimony to lazy sea lions, images of creatures great and small. From an leaping lemur to a skateboarding pooch, find images of animals great and small. “Enter the Dragon” to “Kill Bill Vol. 1,” a look at some of cinema’s best martial arts films. The next time Allan Kieta thinks there might be an intruder in his home, he’s not going to rush blindly into a fight for his life. The 49-year-old Indianapolis husband and father of two meant that literally when he said it Thursday on TODAY. Kieta really is blind, but that didn’t stop him from subduing a would-be burglar 24 years his junior with wrestling moves learned more than 30 years ago. The battle took place Monday and lasted from 30 to 40 minutes. Kieta wasn’t even supposed to be home, but he decided to take a day off from work and sleep in. When his pet poodle started barking hysterically, he got out of bed and, instead of calling 911 on the phone or listening to try to determine who was in the house, he opened the bedroom door and went into the hall — and straight into an intruder. Some 32 years ago, Kieta had been a champion wrestler in high school, and his father was a Marine who taught his son some tricks of the trade. Since he couldn’t see to trade punches with the intruder, Kieta said he knew he had to use his wrestling skills to get the fight onto the floor, where blindness would not be a great handicap. Kieta acted as if it weren’t that big of a deal. Once he got the intruder, later identified as Alvaro Castro, 25, on the ground, he was able to control him. In doing so, he remembered a trick his father had told him about and lifted Castro up by his belt, which forced his upper body down. The battle went from the hallway through the laundry room and into the kitchen. During the life-or-death struggle, Kieta kept asking the intruder why he broke into his house. Castro also said he was looking for Kieta’s daughter, 18-year-old Alexandra; he also has a 16-year-old son, Allan III. Kieta later learned that Castro had worked with a crew on their yard three years earlier and had befriended Alexandra and Allan. Kieta figures that Castro thought no one would be home on a Monday morning and the house would be an easy touch. Once in the kitchen, Kieta dragged Castro to the stove and grabbed a large chef’s knife. He held the knife to Castro’s throat and went for the telephone. With his right arm wrapped around Castro’s neck and near total exhaustion, it took Kieta about 20 tries to dial 911 with his left hand. He was so frustrated and Castro was so terrified that he offered to dial 911 himself. “He said, ‘Please, let me dial it. Please don’t kill me,’ ” Kieta said. But he finally got the three digits right and told the operator his situation. “Is he trying to fight with you right now?” the operator asked. “No, I got the knife to his neck,” Kieta replied with remarkable calm.Police rushed to the home and arrested Castro. Kieta said his jaw was sore the next day from a few punches Castro got in, but otherwise he feels fine. But, he added, the next time his dog starts barking wildly, he’s not going to rush into another fight. Lauer asked Alexandra if she was impressed by what her father had done. Do you Remember that #1 Gun Rule? The 71-year-old retired Marine who opened fire on two robbers at a Plantation, FL , sub shop late Wednesday, killing one and critically wounding the other, is described as John Lovell, a former pilot for two presidents. He doesn't drink, he doesn't smoke, he works out everyday. Lovell was a man of action Wednesday night. According to Plantation police, two masked gunmen came into the Subway at 1949 N. Pine Rd. Just after 11 p.m. There was a lone diner -- Lovell, who was finishing his meal. After robbing the cashier, the two men attempted to shove Lovell into a bathroom and rob him as well. They got his money. But then Lovell pulled his handgun, opened fire, shooting one of the thieves in the head and chest and the other in the head. When police arrived, they found one of the men in the shop. K-9 units found the other in the bushes of a nearby business. They also found cash strewn around the front of the sandwich shop according to Detective Robert Rettig of the Plantation Police Department. Both men were taken to Broward General Medical Center, where one, Donicio Arrindell, 22, of North Lauderdale died. The other, 21-year-old Frederick Gadson of Fort Lauderdale is in critical but stable condition. as a pilot for the Marines, flying former Presidents John F. Kennedy and Lyndon B. Johnson. He later worked as a pilot for Pan Am and Delta. Lovell is not married and does not have children. He is not expected to be charged, authorities said ''He was in fear for his life,'' Rettig said. 'These criminals ought to realize that most men in their 70's have military backgrounds and aren't intimidated by idiots. The only thing he could be charged with is participating in an unfair fight. One 71 -year young Marine against two punks. Two head shots and one center-body-mass shot - good shooting! That'll teach them not to get between a Marine and his meal. Don't you just love a story with a happy ending? The author's thinking is aligned with what Ed Parker thought about tying up his hands by grabbing one guy. I've hammered home the importance of the cold hard fact: "you do what you train". Anything you do in a training environment is exactly how you are conditioning yourself to respond in a life-or-death situation. Most of my clients understand this principle in applying trauma to the body. They are careful to insure that they strike with a tight fist or make sure that they complete the rotation of their body to deploy maximum force upon the given target area of the other guy.So where do problems occur? Most people train for a one-on-one confrontation.They are excellent at handling the one guy but add in another guy... and watch the meltdown occur.I was training a well-known counter-terror unit a few years back and let them see first-hand the danger in this oversight.They had been training heavily in a well-known ju-jitsu system prior to my course. This was a combat sport-based system that is very effective in the ring.But it does no good to tell people that what they trained may have problems associated with it because often they have a strong emotional attachment to the training. Better to let them see a gap and then offer a solution.So I asked for the best grappler of the group to don his field gear and go to the end of the training hall. I then grabbed 3 other members of the unit and had them do a simple "sacrificial lamb" attack. This is where one guy engages the prey and locks him up, then the other 2 swoop in for the kill.Well, sure enough, the first guy engages and is quickly taken to the ground by the fighter and put in a very painful arm-bar. This guy was amazingly good at ju-jitsu and would be a terror in the ring -- except this wasn't a ring, and there was no ref. In fact, no sooner had the arm-bar been applied than the other 2 were upon him, had his weapons and could have "killed" him at any time.This simple gangbanger attack easily defeated a highly trained operator because he had handled a multifight like a sport competition. In fact, the unit later confessed that they had never trained with their weapons on the whole time they trained "hand-to-hand". The focus had been more to see who could make the other "tap out" first. This is a dangerous way to train for a lethal criminal confrontation.You must always treat every confrontation as having multiple guys. You need to be instructed how to be a "360-degree" fighter and to be aware of your surroundings at all times. In TFT, all fighting is against multiple guys even in a one-on-one training session. This means as I take out my current victim I'm aware of my surroundings and SEARCHING for my next victim.The training methods we use are beyond the scope of this newsletter. But if you've never really trained for multiple guys then you've never trained for life-or-death confrontations. Don't make that mistake. Poor readers achieved brain activation levels seen in skilled readers after 100 hours of extra trainingJust as a disciplined exercise regimen helps human muscles become stronger and perform better, specialized workouts for the brain can boost cognitive skills, according to Carnegie Mellon scientists. Their new brain imaging study of poor readers found that 100 hours of remedial instruction - reading calisthenics, of sorts, aimed to shore up problem areas - not only improved the skills of struggling readers, but also changed the way their brains activated when they comprehended written sentences.The results may pave the way to a new era of neuro-education.Carnegie Mellon researchers say poor readers initially have less activation in the parietotemporal area of the brain, which is the region responsible for decoding the sounds of written language and assembling them into words and phrases that make up a sentence, than do good readers. However, remedial instruction increases the struggling readers' activation to near normal levels.This also was the first brain imaging study in which children were tested on their understanding of the meanings of sentences, not just on their recognition of single words. "This study demonstrates how the plasticity of the human brain can work for the benefit of remedial learning," says neuroscientist Marcel Just, director of Carnegie Mellon's Center for Cognitive Brain Imaging (CCBI), and senior author of the new study currently available on the Web site of the journal Neuropsychologia. "We are at the beginning of a new era of neuro-education. "The poor readers worked in groups of three for an hour a day with a reading "personal trainer," a teacher specialized in administering a remedial reading program. The training included both word decoding exercises in which students were asked to recognize the word in its written form and tasks in using reading comprehension strategies. The poor readers were 25 fifth-graders taken from a stratified sample from schools in Allegheny County, which is home to Pittsburgh and a number of its surrounding municipalities.Using functional magnetic resonance imaging (fMRI), CCBI Research Fellows Ann Meyler and Tim Keller measured blood flow to all of the different parts of the brain while children were reading and found that that the parietotemporal areas were significantly less activated among the poor readers than in the control group. The sound-based representation that is constructed in the parietal areas is then processed for the meanings of the words and the structure of the sentence, activating other brain areas.The sentences were relatively straightforward ones, which the children judged as being sensible or nonsense, such as "The girl closed the gate" and "The man fed the dress." The children's accurate sensibility judgments ensured that they were actually processing the meaning of the sentences, and not just recognizing the individual words.Further, the activation increases in the previously underactivating areas remained evident well after the intensive instruction had ended. When the children's brains were scanned one year after instruction, their neural gains were not only maintained but became more solidified. "With the right kind of intensive instruction, the brain can begin to permanently rewire itself and overcome reading deficits, even if it can't entirely eliminate them," Just said.These findings of initial parietotemporal underactivation among poor readers provide evidence against a common misconception about dyslexia. There is a persistent but incorrect belief that dyslexia is primarily caused by difficulties in the visual perception of letters, leading to confusions between letters like "p" and "d". However, such visual difficulties are the cause of dyslexia in only about 10 percent of the cases. The most common cause, accounting for more than 70 percent of dyslexia, is a difficulty in relating the visual form of a letter to its sound, which is not a straightforward process in the English language. The same parietotemporal areas of the brain that showed increased activation following instruction are centrally involved in this sound-based processing.The findings also give hope to using the marvels of brain plasticity for instructional purposes in "new" (for the brain) subject areas. "The human brain did not evolve to process written language, which is a cultural invention dating back only 5000 years," Just said. "Some people's brains happen to be less proficient at relating written symbols to the sounds of language, and they need focused instruction to get those areas up to an adequate level of performance." Other skills that may be valuable as newer technologies (than written language) arise should also be amenable to neuroinstruction. "Any kind of education is a matter of training the brain. When poor readers are learning to read, a particular brain area is not performing as well as it might, and remedial instruction helps to shape that area up," Just said. "This finding shows that poor readers can be helped to develop buff brains. A similar approach should apply to other skills." Tim Walker sent this in. It's about shot placement and refers to handguns but the information as to psychological "Superman Effect" is also applicable to unarmed combat. This is just a part of the article, published by Frontsite, and shooting school in Nevada. One of my friends went there recently and said it's worth going back to take again. The Labor Day weekend mini-camp was attended by 15 children and 20 adults from six states. Steve White's seminar for business owners was very well received. The children's seminar was co-taught by Florida's Tim Walker and South Carolina's Bruce Meyer. Bruce remarked that one of the kids talked with him afterwards and told him the last time he had visited he was a yellow belt and now he's going for brown. All the kids had a good time and got participation certificates. Thanks to K. Zwarg's Karate and Gulf Coast Kenpo for their support. (That's Tim in the photo). Saturday's seminar was kicked off by Mr. Meyer, who taught aspects of developing and executing self-defense demos and competition routines. The battle cry was "You gotta sell it!" Steve White followed with a dynamic presentation of how to increase your knowledge by looking into your sequences instead of just collecting more "stuff". A lunch break included some presentations. Jim Middlebrooks, an artist from South Carolina and black belt under Bruce Meyer, was present. Jim does portraits of fallen soldiers for the families and gave me a book of them. Two members of the Special Forces Motorcycle Club were on hand to be part of the presentation, Bo McCormick and Bill Hood, shown in the photo below. SFMC is giving Jim a certificate of appreciation for his efforts. We had all the veterans of the armed Forces present jump in the photo too, also below. 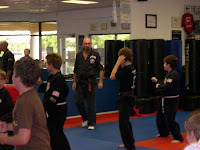 Ed Cabrera taught a great class on infusing boxing into Kenpo, followed by my presentation on the overkill principle. The seminar was concluded with a short session in which some of us present who knew Mr. Parker told a few stories and answered questions. Ed Cabrera, Lance Soares, Tony Velada, Bruce Meyer, Dr. Francis Rene, Steve White, and myself comprised a panel, which was a lot of fun. Many in the group joined us for dinner that evening. Sunday morning the out-of-state participants left, some of them had to change their flights home due to Hurricane Gustav. Below is an e-mail I received after the camp. Dear Mr. Wedlake: I just want to drop you a short note to tell you how much I enjoyed the camp. "Drinking from a fire hydrant" is a big understatement! Each one of the segments presented by you, Mr. White, Mr. Meyer and Mr. "Eddie" Cabrera was unique and well thought of with many useful 'take away' concepts. Just as important, it was a lot of fun to work out with buddies from all over the country and exchange ideas with them. Finally, getting insights about Mr. Parker's life and personality from people that met him was a wonderful ending. All in all, it was a terrific experience... Thank you for making it happen! If you were there, thanks for your support. If you missed it, I hope you can make a future event. By Jackson Holtz, Herald WriterMONROE -- A few hours before Donna Angevine smacked an intruder in the head more than 20 times with a baseball bat early Thursday, she was sparring with her tae kwan do instructor.He had to egg her on. "Hit me," the instructor told her. Be aggressive.The self-defense and martial arts training paid off for the Monroe woman, 45, when she and her husband, Roger Angevine, woke up to find a man in their bedroom. "I'm here to rob you," they remember him saying.Nearly a week later, the couple has stitches and deep purple bruises. Donna Angevine has a black eye. Her husband, 48, has a foot-long bruise on his side and a bite mark on his thigh.The carpet in their bedroom, where the attack occurred, was removed. Police said the blood from the fight rendered it a biohazard and it needed to be destroyed.The intruder is behind bars.Taking a break from mowing their lawn Tuesday, the couple -- he's a retired business owner and she's a doggie fashion designer -- recounted their ordeal.Roger Angevine said at first he thought maybe the intruder was a friend pulling a prank. He asked the man if he was serious. "Does this feel serious?" the stranger said.Angevine felt the sharp slap of a baseball bat against his torso.The blow triggered a 15-­minute struggle.The man ordered the couple, who were naked and unarmed, to the ground.That's when Roger Angevine decided to fight back.He tackled the intruder, hitting him with such force that he knocked the man's head through the drywall. "My goal was to grab onto his wrists and hold on," Roger Angevine said.An avid snowmobiler, Roger Angevine said he knows how to grip handlebars strong enough to save his life. Grasping the man's wrists was similar.The couple was able to take away the intruder's gun and baseball bat. "Hit him! Hit him! Hit him!" Roger Angevine yelled to his wife.Again and again, Donna Angevine swung the bat at the man's head. She pleaded with him to stop fighting, but he continued. "Please stop fighting," she said. "I don't want to hurt you anymore. "The fight went back and forth from the bedroom into an adjoining weight room. The two men wrestled while Donna Angevine kept swinging the bat.At one point, the intruder bit Roger Angevine's thigh. "That's actually what pissed me off," he said.Finally, the intruder succumbed. The couple hog-tied him with belts and Donna Angevine sat on him until Snohomish County sheriff's deputies arrived. "I came to make a quick buck," the man, 24, told police, according to court papers.He said he walked from his Bothell home to the couple's residence at the end of a long private road in rural Monroe, the documents said. "You have a lovely home," the man told the couple during the robbery attempt. "I thought you'd have lots of cash. "The intruder was hospitalized Thursday with a head wound. On Friday, he was booked into the Snohomish County Jail for investigation of first-degree burglary, first-degree robbery, second-degree assault and possession of a stolen firearm. He was being held Tuesday on $100,000 bail.Police found in the man's backpack a knife, plastic zip ties, white nylon rope, black duct tape and a single roll of toilet paper, potentially for use in gagging his victims.Roger Angevine said he finds it hard to believe someone would randomly stumble upon the house he and his wife built eight years ago. The intruder also seemed to know the layout of the house.The man slipped in through an unlocked door, fetched a slab of bacon from the kitchen to lure the couple's three dogs away and found the bedroom amid the sprawling floor plan, Angevine said.Snohomish County detectives continue to investigate the break-in. The Angevines acted in self-defense and will not face charges, officials said.The couple said they're locking their doors and have beefed up their security plan.They hope their ordeal will provide a cautionary tale to others. "You can't rely on locked doors to stop a guy with a gun, baseball bat and a mission," Roger Angevine said. "You have to be able to defend yourself. "On Tuesday night, Donna Angevine said she continued her self-defense training at a session for women at Tiger Rock tae kwon do in Monroe. "The guy just picked the wrong people to mess with," she said.